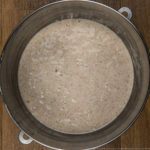 I kept a starter alive at the restaurant for a number of months but, if I am honest, although we made some acceptable sourdough, it never really fitted into the rhythm of a small commercial kitchen. We had no prover and just the space that the trays of proving rolls took up was a pain. Ultimately, I went back to baker’s yeast and either straight yeasted loaves or, for the ciabattas and focaccia, a yeast starter left to prove overnight in the fridge. 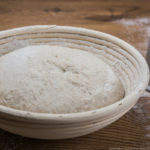 I got a beautiful cane banneton proving basket for my birthday this year and it felt slightly wrong to be proving commercial yeast loaves in it, so a new sourdough journey began. All my knowledge of baking bread has come from books, experimenting and chatting to other chefs and bakers. 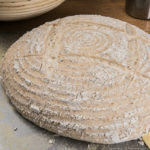 I spent a whole week one January years ago working on a single bread recipe for the hotel I was working in – the joy of time to experiment during a closed period. The Roux brothers ‘Patisserie’, Pierre Koffmann’s La Tante Claire and Shaun Hill’s Merchant House would have all been early influences on my bread recipes but ‘Baking with Passion’ by Dan Lepard and Richard Whittington is a well-thumbed and slightly tatty volume in my bookcase. It has been properly used on the front line. This is the book I went back to last month to start making sourdough loaves once more. I have adapted the recipe a bit, more to suit my own taste and needs than for any other reason. 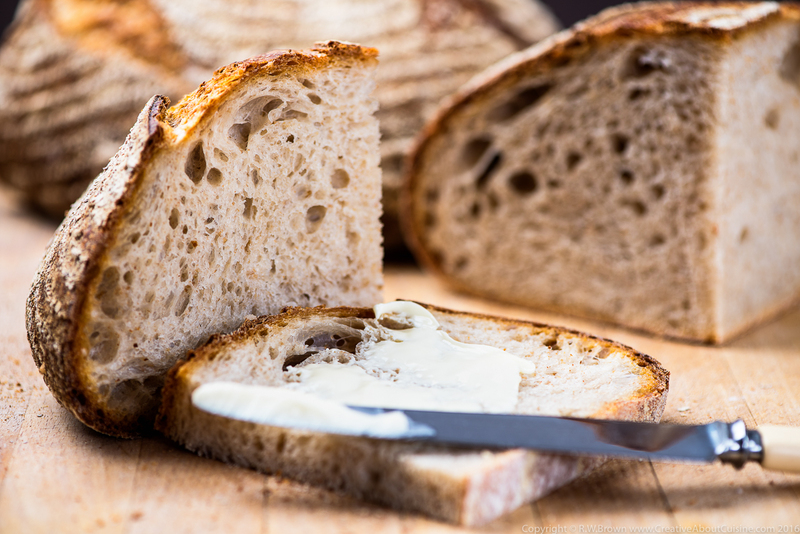 I like some rye flour in the mix and I only want to bake a single loaf, probably once a week. So I have reworked the quantities to suit, but credit has to go to Dan and Richard for a superb place to start. Fortunately you can still buy the book; it’s well worth getting a copy. 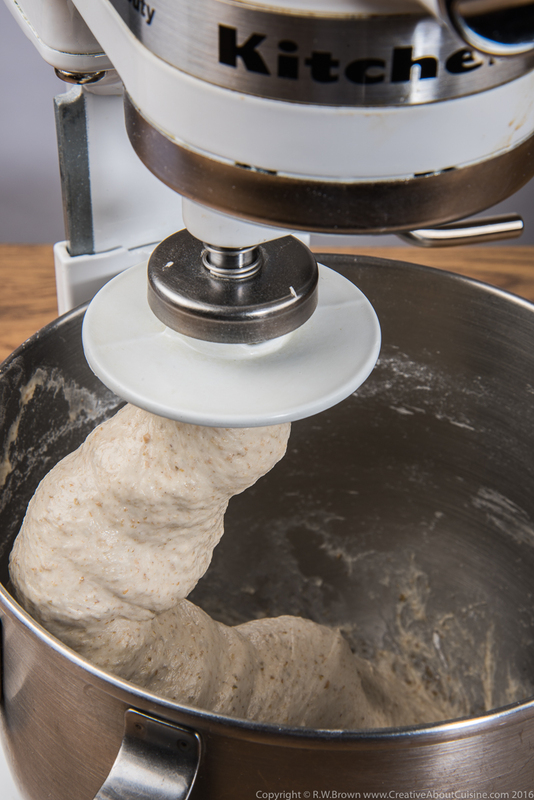 Combine the flours and liquids in the bowl of a stand mixer and beat well for 5 minutes. Pour into a clean bowl, scraping out well and add the fruit. Dust the top with 1tbs rye flour and cover the bowl with clingfilm. Leave at a warm room temperature for 24 hours. Add the yoghurt and milk to the mix and beat in well. Add the strong white flour, beating again to thoroughly combine. Cover and leave for another 24 hours. The mix should be obviously bubbly by now. Remove 150g of the mix and beat in the milk and yoghurt. Strain the mix into a clean bowl to remove the fruit and then beat in the flour. Repeat the removal of dough and feeding each day. I baked my first loaf on day six but was reluctant to throw the removed dough away! 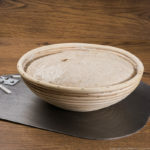 It works well as the base for pancakes and makes fantastic pizza dough. 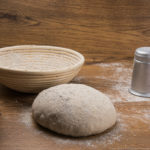 The recipe for pizza dough is at the end of the article. 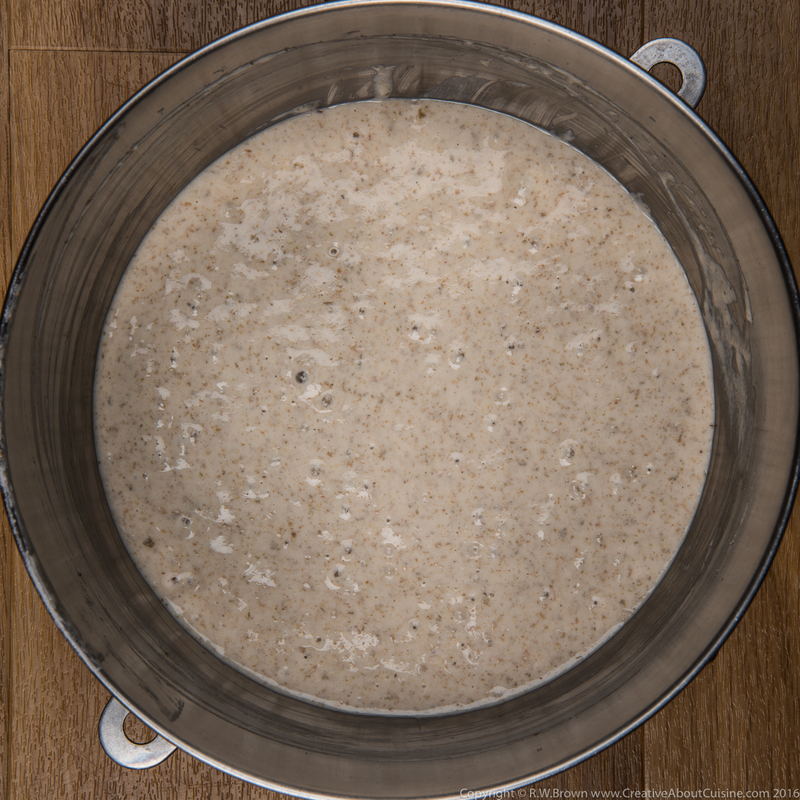 So by now you should have a very active and bubbly starter that can be kept in the fridge. It won’t need feeding every day and I have changed to bottled water and flour for feeding as opposed to the milk, yoghurt and flour. So far, I have baked a loaf a week and made one lot of pizza dough. This way, I’m replacing the dough I’m removing with 50/50 flour and water twice a week, and it seems to be thriving. Combine the ingredients in the mixer bowl and beat together for 5 minutes. Cover and leave to prove for 4-5 hours. Sift the flour over the sponge and sprinkle on the salt. 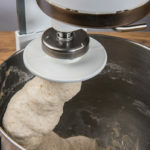 Mix on a low speed with the dough hook for 5 minutes. Increase the speed slightly and mix for another 12 minutes. 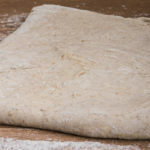 Tip the dough out onto a floured tray and cover loosely with clingfilm and a tea towel. I find the release sprays such as Trenwax really useful for spraying on the clingfilm to stop it sticking to proving dough. 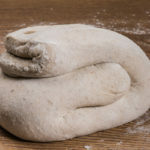 Leave to prove for 1 hour and then gently stretch the dough out into a rectangle, fold in half lengthwise and then fold a third in from the bottom and a third down from the top to make a rough ball shape. Return to the tray, cover again and leave to prove for 40 minutes. Repeat this process 4 times in total. The next step is to shape the loaf as you choose. 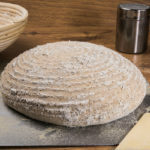 Heavily flour the banneton with rye flour or dust the proving cloth and place the shaped loaf into its basket or cloth*. Cover and prove for around 4 hours until roughly doubled in size. At this stage you can put the loaf in its cloth or basket in the fridge overnight, if necessary. I find that proving does take longer the following day (my fridge runs at around 2-3℃), especially as we aren’t exactly enjoying a warm summer! To bake the loaf, I use a baking stone that has been preheated in the oven for at least 45 minutes. I also have an old metal tin in the bottom of the oven to add water to, to create some steam. Bake at 230℃ for 15 minutes with a cup of cold water poured into the preheated metal tin. Reduce the oven temperature to 180℃ and bake for another 40 to 50 minutes. I move the loaf off the baking stone onto the wire shelf for the last 10 minutes of cooking. Allow to cool on a wire rack, cool completely before cutting if you have the patience! 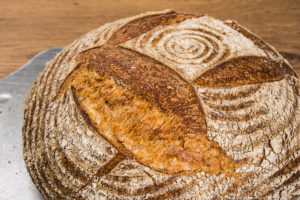 I am by no means a bread expert but making bread is a real pleasure, I have had good results but much of the credit must go the many people I have gleaned my knowledge from. 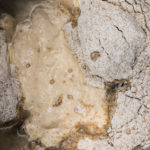 My starter is now just over a month old and yesterday I baked the first loaf that had a really obvious acidity to it. For the pizza dough I use the following recipe. Combine the ingredients and mix with a dough hook for 10 minutes. Allow to prove for 4-5 hours before shaping into a pizza base. To bake, preheat the oven on its hottest setting with a baking stone for at least 45 minutes. The pizza will cook in around 6 minutes using this method. Still a far cry from the speed of a proper pizza oven but the result is pretty tasty! Below are some websites to take a look at and some great people to follow on Twitter and Instagram.